This is a sponsored post on behalf of Fresh Flowers.com. However, All opinions are 100% mine. There are many ways to show your special someone you love them. There are hugs, kisses, and washing the dishes. That being said, one of the favorite ways to show you care is to shower them with flowers. Giving flowers as a form of affection dating back thousands of years from the early civilizations’, use of flowers as part of their gifts to the Gods is a symbol of affection. During the Victorian Era, flowers were always given as a form of affection and love. That’s why with Valentine’s Day being a month away flowers are the perfect way to show you care. than what you see. For example. 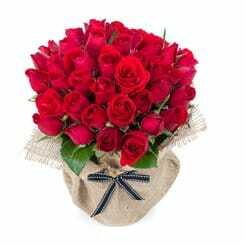 Red roses imply passionate and romantic love, pink roses could mean a lesser affection, white roses suggested virtue and chastity, and yellow roses stand for friendship or devotion. A flower’s color, size, condition, and position in relation to other flowers in a bouquet, for example, all conveyed meaning without saying a word. Flowers aren’t just aesthetically pleasing to the eye but they’re also scientifically proven to make one feel better. Researchers at Rutgers University did a ten-month study and concluded that there is a link between flowers and moods, and this research could prove to be the foundation of a whole new way to do therapy. In one experiment, those who were feeling low and depressed felt good almost immediately after receiving a gift of flowers. I like flowers but prefer not to have my husband spend a bunch of money we can’t afford on a bunch of cut flowers I’ll end up throwing away. I love flowers but prefer a potted flower over cut flowers. I love to be able to plant them in my flower bed and remember them year after year. Victorian era people sure had a way with flowers! Since I’m allergic to roses, my husband has given me carnations and daisies instead. Carnations also represent love, and daisies symbolize beauty as well as loyal love. I’m more of a dark chocolate fan than flowers, I may be the odd one out for valentine’s day gift idea but I do appreciate seeing a fresh vase of flowers at home. Love getting flowers! Makes my house look pretty. But my husband is allergic, so we can’t have them in the home anymore. I work from home now, so there’s that, no office. Haha! But… This reminds me of the time when my husband and I started dating and he went to the flower market, arranged flowers in a vase, and had his coworker deliver it to my work. He even had his coworker carry a clipboard with a fake delivery paper for me to sign. I think he told me he did that a few years later. I loved how it was really personal and that he planned something like that. It’s definitely a treat when I receive flowers or a cpl of red roses from my hubz..It doesn’t happen too too often as I do not feel totally a-okay with the cost of flowers or a few roses from the flower shop..I guess I wouldn’t worry too much if we weren’t a low-income family (and that the honest truth)..But on the rare occasion when I do receive some thoughtful flowers, they are always from a small home run business (usually a family household ran backyard garden, so it’s an offer what your able to pay for some gorgeous flowers 🙂 Thanks for posting this insightful post re: Valentine’s Day and the gift of flowers (and the meaning behind it all).. I love getting flowers. My husband tends to think they are a waste. I rarely get flowers but do llove them especially in the winter. To me it reminds me of spring. I am afraid I am not married to a romantic…. so when I do get them I appreciate the thought. I love sending flowers to relatives and friends for special occasions and sometimes just to let them know I’m thinking of them. Flowers do put me in an upbeat mood. I love to receive them too. I miss getting red roses,chocolates and dinner on Valentines Day.My late husband always got me roses,chocolates and always made me dinner. I love to give and to receive flowers for Valentine’s Day. I love getting red roses on Valentines Day, make the day so special! My husband knows that yellow roses are my favorite! We married when I was 27 and I had 27 yellow roses in my bouquet with just ivy. It was really beautiful! My Mom had the same bouquet but with red roses. Yes!! Flowers can really improve a mood and the atmosphere in your home!! I enjoy having them around and especially smelling them!! I received sunflowers one year as a Valentine’s gift. More people complimented them than any of the other ladies that had the traditional Valentine’s bouquets on their desks. I love flowers, but I hate to spend a lot on them when they don’t last more than a couple days. I am not sure what I want this year. I love flowers, and I especially love to get them!! Roses are my favorite! I have not gotten a nice bouquet or even a small amount of flowers in a very long time. But one year I got my grandmother a bouquet for Valentines day. Her husband of 42+ years died in 1997- SHe is still alive at 87 and she has been alone since she was 67-68. He died 7 days before her birthday. I feel bad that she has been alone for so long. It is nice to surprise someone special like that who does not have any one else to do it for them. SHe said ‘you shouldn’t have spend your money like that- but I got an affordable piece and it made her feel special. it was worth so much more than I paid for it~! Giving flowers is never a mistake. Roses always a favorite! My mother loves flowers! My dad gets them for her every year! I Love to get Flowers! I Feel so Great and Special when I receive Flowers from someone! !It definitely is a true jester of Fondness~ & Thoughtfulness!! When I receive Roses to me that is a jesture of Love! I just love all Flowers and when anyone brings or sends me Flowers I am Thrilled! I love getting flowers on Valentine’s Day! Sometimes the hubby and I pick some out together to arrange on the table since it makes the kitchen looks so cheery!